Thank you for stopping by and making us a part of your day! Today we have another challenge for you! Today’s challenge is hosted by Designer Janet of My Cards For You. Janet is another one of our Faithful Design contributors! Her cards are simply gorgeous! Her detail work on each work of h(art) is truly inspiring! Be sure to visit Janet and see all the wonderful things on her blog. Here’s our girl Janet with one very well known “scraplebrity” Tim Holtz. 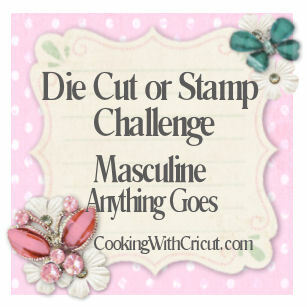 Today Janet challenged us to an anything masculine-boy or man challenge. So pull out all the stops and lets see those projects created for all the “men” in your life....Yes, we use the term men loosely as often times, they are just older boys...lol. But what would we do without them!!!! Let’s see what super things the designers came up with! Created this adorable card using the King of the Grill Digi from PCW. Head over to her blog for all the details. Evelyn also treated us to this FANTASTIC layout! Look at all the details! She used the Football Bears cutting file set from PCW for her great title! Once again, be sure to head over to her blog for all the details! I created this simple layout featuring a “lighthouse” theme for a “Father” layout. I used a soon to be released Lighthouse cutting file set from PCW. For this layout I sprayed the brown cardstock with water to dampen the fibers and then balled up the paper in a tight wad. I un”wadded” it and then did it again. I did that process about 3 times and then let it dry. Once it was dry I just hit it with my Dark Brown ink. This gave it that wonderful “rock Like” texture. I did the same with the father letters. You just have to be careful not to rip the paper when doing this technique on small pieces like the letters. I then tore a piece of cardstock in half. I purposely tore it and left the “rough” edges. I used acrylic white paint to cover the tops creating the “white caps” I used a make up sponge to apply the paint but it was a “dry brush” technique in which there was hardly any paint on the sponge. I used a “pulling down” stroke so that the color of the cardstock would randomly show underneath. Once the paint dried I added a light touch of stickles to the top to give the illusion of the sun sparkling off them. Here is a close up. Unfortunately, you still can’t see the glint of stickles, but it is very pretty. You can see that the “tearing” technique helps to give the white caps some dimension. Next Up, I created this Grill master Layout featuring another soon to be released cutting file set from PCW. This layout was previously a kit from Page-Kits.com but now you can get the Bubblicious Fun Boy Bear Cutting File set to recreate this at PCW. Here is another layout that was previously a kit. The Darlin’ Dino’s on this layout will soon be available as a cutting file set from PCW. Lastly, here is one more project. I created this card with a new digi from PCW. King of Cool. This was for my beloved hubby. Be sure to check out PaperCraftingWorld.com on Friday when all these wonderful new cutting file sets and more digi’s will be released! Then create your own masculine masterpiece and JOIN US! * You may use one of the free files in your project. Or one you may already have from PaperCraftingWorld.com. This isn’t mandatory, but we'd love to see what you do with them! these are some fabulous masculine projects. Amazing project by all. Love the files you used. Thanks Melin for the amazing tutorial on the rocks and the water. Very cool. Looks like a watercolor.